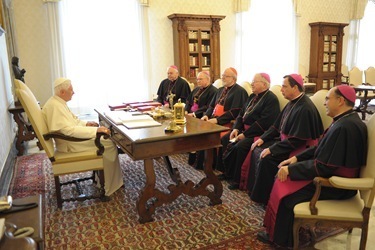 As I mentioned in my last post, last Thursday the bishops of the U.S. Bishops’ Conference Region 1, which is made up of the six New England states, began our ad limina visit to the Holy See. Throughout the coming months, bishops from the other 14 U.S. regions will also make their ad limina visits. 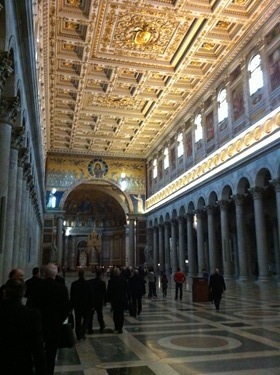 It’s the practice in the Church that every five years each diocesan bishop, together with his auxiliaries, goes to visit the Holy Father, to make a report of the diocese and to pray at the tombs of the Apostles Peter and Paul. 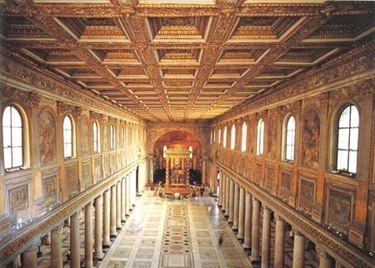 It is also a time when the bishops visit the various dicasteries, that is the departments, which make up the Roman Curia. 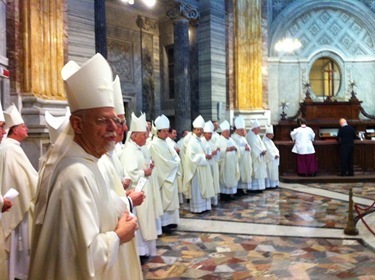 It’s always a very beautiful occasion, an opportunity for the bishops to reflect on our ministry, to pray together, to be with the Holy Father and to reconnect with the catholicity of the Church and our history, which is the history of the Apostles, the history of the Roman martyrs. 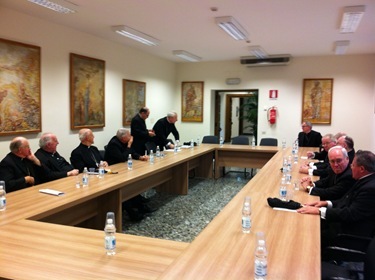 It’s also a wonderful opportunity of fraternity with all the bishops of the region. It provides us with time to pray and talk about the Church in our dioceses of New England. It also is an opportunity for us to visit our priests that are in Rome and the seminarians who are at the North American College. 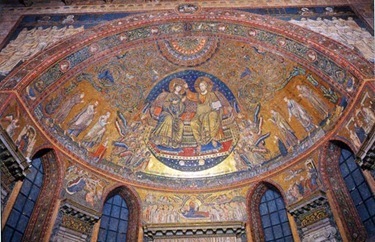 Because most the events of the ad limina are private meetings or liturgies, I understand there was very little detail of the visit even in the Catholic press, let alone the secular media. So, in this post I’ll do my best to recount our activities for you. As you will see, it was a very full week. 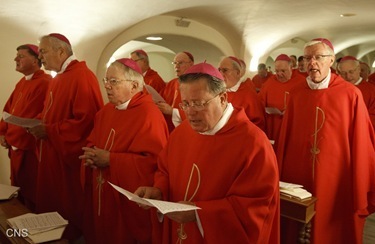 As I told you last week, our ad limina visit began last Thursday with some preliminary meetings and Masses at St. Peter’s Basilica for deceased bishops and cardinals and at the North American College. 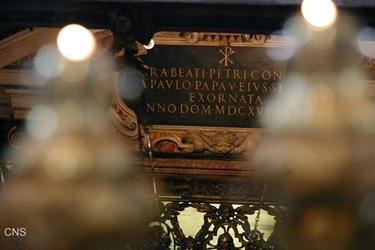 The highlight of the Ad Limina visit is, of course, the meeting with the Holy Father, and the Masses that we celebrate at the tomb of St. Peter, the tomb of St. Paul and the other basilicas. I always find it to be a very moving experience. 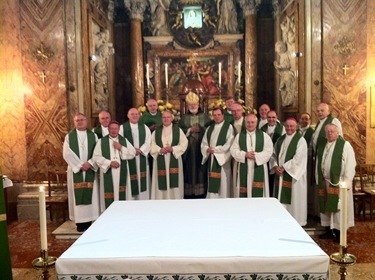 This year the Ad Limina visit started very quickly because almost immediately after arriving, on Friday, we had the Mass at the tomb of St. Peter, at which I was the principal celebrant and homilist, as well as the visit with the Holy Father. The day began with the Mass at the tomb of the Apostle. Later that day we had our meeting with the Holy Father. In addition to the auxiliary bishops, I was very happy to be able to bring several of our Boston priests and seminarians who were in Rome to meet the Holy Father. With us were Msgr. Connie McRae, who now works in Rome; Father Richard Erikson, who is on sabbatical; my priest secretary Father Jonathan Gaspar; the rector of the cathedral, Father Kevin O’Leary; and two of our seminarians from the North American College, Deacon Eric Bennett and Tom MacDonald. 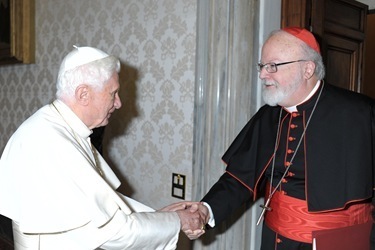 Those who have met him know the Holy Father is an extremely gracious and warm man. 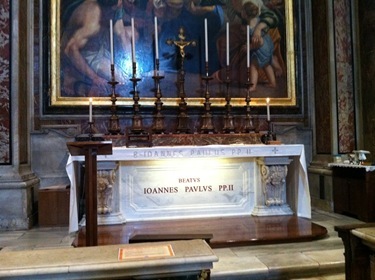 He could not have been more kind or more welcoming to the bishops, the priests and the seminarians who were with us. He greeted them and gave each one a rosary. 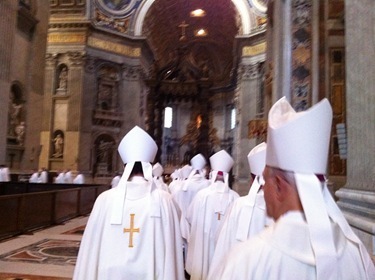 Then, I and my auxiliaries went in for our meeting with the Pope Benedict. We had a very good conversation with the Holy Father, in which updated him on the status of the archdiocese. 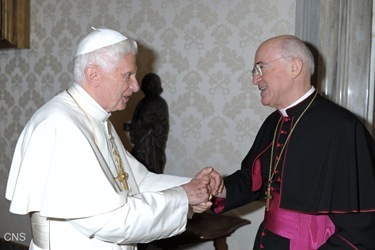 The Holy Father was particularly interested in the programs of evangelization and outreach as well as the situation of the seminary and the Catholic universities within the archdiocese. 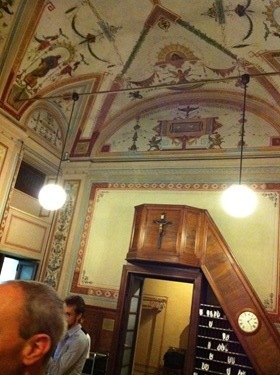 Later that day we met with officials from the Pontifical Council for the Laity, where Cardinal Stanislaus Rylko spoke to us about the World Youth Days and the ecclesial communities. We had a very good discussion about the various lay movements as well as campus ministry. 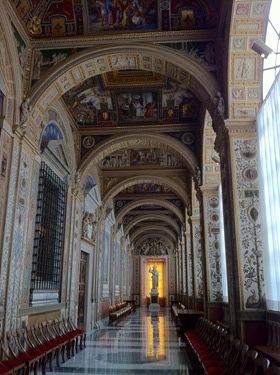 Afterwards, we went to the Pontifical Council for the Family, of which I am a member. There, we had an opportunity to talk about the Church’s ministry to married couples, preparation for marriage and all of the life issues that are a part of the competence of the Council. 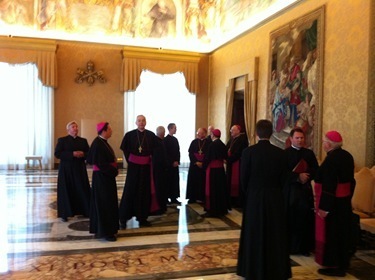 Finally, we met with the Congregation of Bishops, which is headed by Cardinal Marc Ouellet, formerly of Quebec. 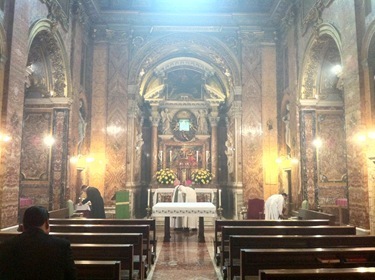 On Saturday afternoon we had Mass at the Church of St. Paul Outside the Walls. 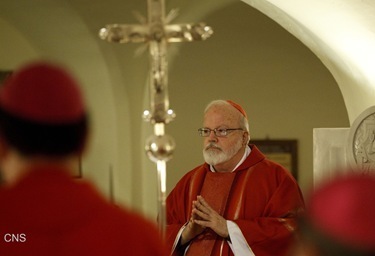 Just as I celebrated and preached the Mass at the tomb of St. Peter, the other Metropolitan Archbishop with us on the visit, Archbishop Henry Mansell of Hartford, was the principal celebrant and homilist at the tomb of St. Paul. 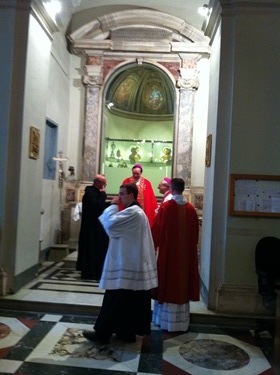 On Sunday morning I celebrated the Mass at Casa Santa Maria, the residence for American priests studying in Rome. Msgr. Francis Kelley is the rector; and Msgr. McCrae, who was with us for the meeting with the Holy Father, is the spiritual director. It’s interesting that one of my predecessors, Cardinal William O’Connell, was at one time a rector back when the North American College was there. The building of Casa Santa Maria is very historical; it’s at least 300 years old. It was originally a convent of cloistered Dominican nuns, and then it became the original site of the North American College. Then, once the new building was built for the North American College, it became the Casa Santa Maria. I took some pictures of the refectory there, because it had been renovated by Cardinal O’Connell and much of the work was paid for through the generosity of the Catholics of Lowell. That afternoon I was pleased to be able to meet the new Apostolic Nuncio to the United States, Archbishop Carlo Maria Viganò. I did not know him before, and it was a chance for us to talk about the Church in the United States and his new mission here. I also expressed to him our sorrow at losing Archbishop Pietro Sambi so suddenly, but also our gratitude for all the good that he accomplished during all those years as the Holy Father’s representative in our country. 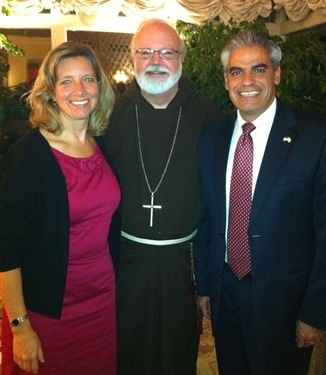 We look forward to Archbishop Viganò’s arrival in Washington. He will be present with us for our bishops’ meeting next week in Baltimore, and we pray that the Lord will bless his mission as Nuncio to the United States. Monday morning through midday was occupied with meetings with the Congregation for Clergy, the Congregation for Catholic Education and the Pontifical Council for the Pastoral Assistance to Healthcare Workers. 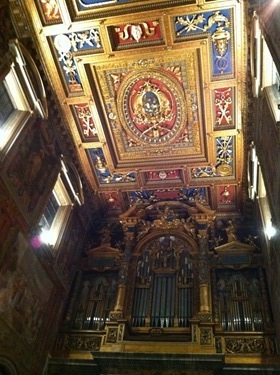 In the afternoon we had Mass at another of the Papal Basilicas of Rome, St. Mary Major. Bishop William Lori of Bridgeport presided at the Mass and in his homily he spoke about Cardinal Newman’s visit to St. Mary Major before his conversion. Again on Tuesday we met with several dicasteries for much of the day. This time with the Congregation for Institutes of Consecrated Life, the Congregation for Divine Worship and the Pontifical Council for Promoting Christian Unity. 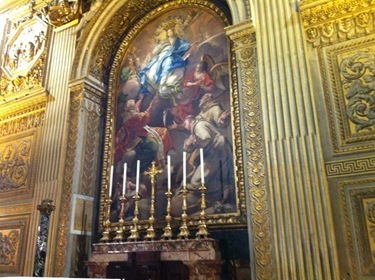 In the late afternoon, we had Mass at the last of the four Papal Basilicas, St. John Lateran, where Bishop Richard Malone of Portland, Maine presided and preached. That evening, the U.S. 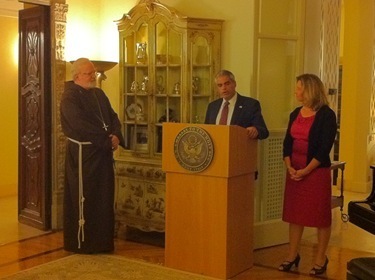 Ambassador to the Vatican, Miguel Diaz, and his wife, Marian, hosted a reception in honor of our visit. The bishops of Region 1 and some of our guests were with us. I knew Miguel from my time in Palm Beach. He and his wife are both theologians; and he was teaching in the seminary and his wife was involved in evangelization programs for the Diocese of Palm Beach. During his remarks, he said that I had been the boss of both of them! 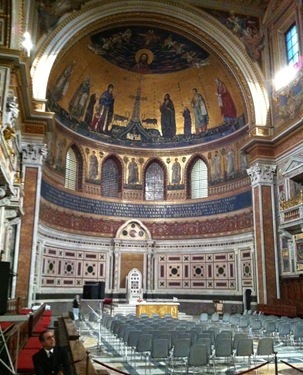 He also said how important the diplomatic relations between the United States and the Holy See are. 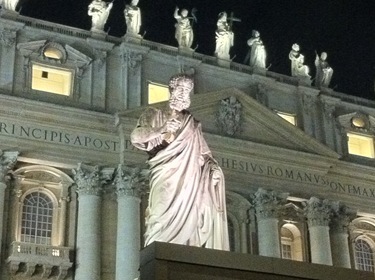 It is an opportunity to foster better communication between the Holy See and our government. In my remarks I added that that his “former boss” is very proud of the fact that two of his recent predecessors as Ambassadors to the Holy See have been Bostonians – Ambassador Raymond Flynn and Ambassador MaryAnn Glendon. 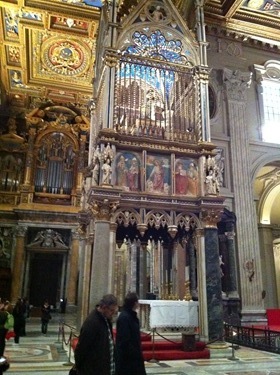 On Wednesday, the last day of our visit, we began the day with an early morning Mass at the Altar of the Tomb of Blessed John Paul II in St. Peter’s Basilica. Bishop Thomas Tobin of Providence was the principal celebrant and homilist. In his homily, Bishop Tobin spoke about his personal encounters with Pope John Paul and the significance they had for him. 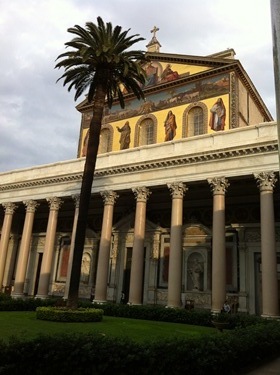 After the Mass, which was about 9 a.m., we met with the Apostolic Signatura, which is the high court of the Vatican, something akin to our Supreme Court. 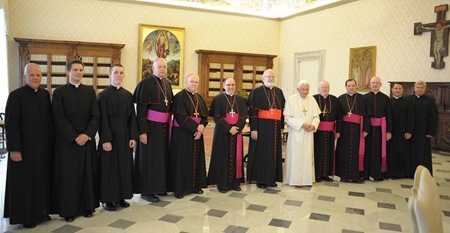 From there, we went to our last meeting of the ad limina visit, which was with a brand new dicastery, the Pontifical Council for Promoting New Evangelization. The Holy Father established it about a year ago and we are told that Father Luigi Giussani, the founder of Communion and Liberation, was one of those who had suggested that such a dicastery be founded. 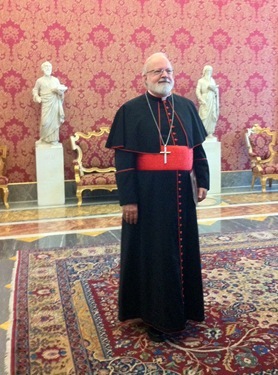 It was very interesting to learn more about this new dicastery, headed by Archbishop Rino Fisichella. 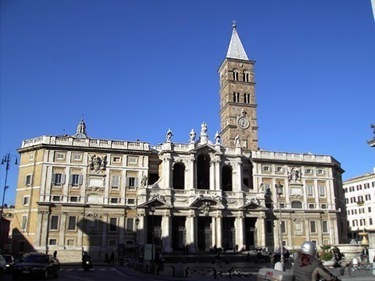 They hope to organize city-wide missions in many of the large metropolitan areas of Europe as a preparation for the Synod on the New Evangelization to be held next year. 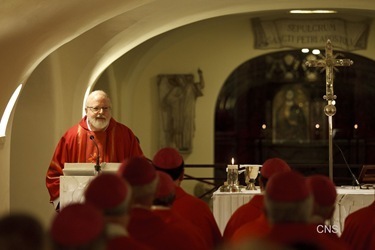 However, they are waiting for the Synod itself to take place and for the post-synodal document to really set the course for that new dicastery. It was a very hopeful encounter and we could see that there was a great deal of energy there. 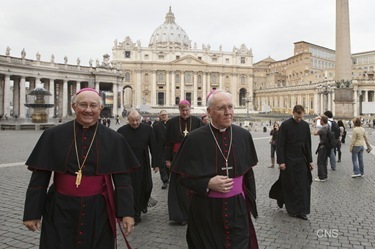 All the bishops were very pleased to see the progress in the establishment of this new dicastery and I am very hopeful that it will be able to help people to understand, and to become involved in, the new evangelization. 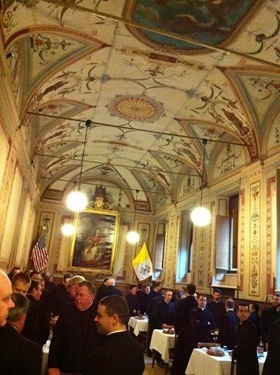 Finally, on Wednesday evening, we were invited to a parting reception at Villa Stritch, the residence for American priests working in the Roman Curia. It was a very nice evening. On Thursday, a week from when we arrived, we departed again for home. In all, it was an inspiring week. The liturgies were very beautiful and we were grateful to have had several of our priests who were in Rome join us for some of the Masses. In addition to those already mentioned, they included Fathers Jim O’Driscoll, Steve Madden, Jim Flavin, John Kiley and Doc Conway. 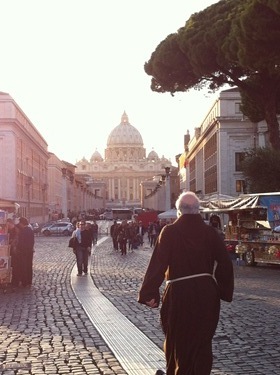 Some were on sabbatical or retreat; others were in Rome as part of other travels. We are also grateful that the seminarians and the young priests who are studying at the North American College and the Casa Santa Maria were a part of those Masses, including our own deacon, Deacon Eric Bennett and a deacon from Providence, Deacon Ryan Connors. 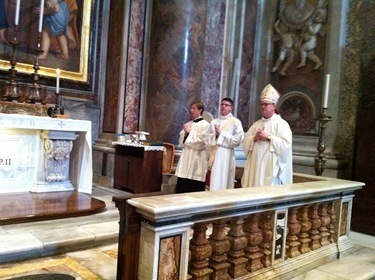 The seminarians served at the Masses and assisted with the music and the readings. It was uplifting to be able to hear our other bishops preach. Bishop Lori, Bishop Tobin, Archbishop Mansell and Bishop Malone all gave very inspiring reflections for us. It was a beautiful and intense moment of prayer. 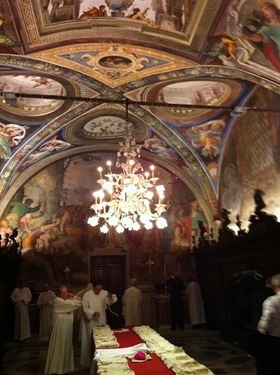 Throughout the visit, all of us were praying especially for our priests, religious, deacons and people back home. We see our visit to the Holy See as representing our people in this moment of prayer and reflection at the heart of the Church in Rome.